The interior was easy --- we kept it original. That's correct�outside of a headliner replacement (sagging), the Black Kiwi Bucket Seat interior is 100% original from the carpet to the dash to the gauges to the seats to the seat-belts to the shifter and console to the door panels. Check out the sill plates � those are originals! Guys, if you want to achieve a perfect score at the next MCA National Event for an interior in a 69 Boss 302, come study this car � it's exactly the way it left the factory 40 years ago, and it's NICE. There are no rips, cracks or deformities to be found. All gauges operate perfectly. The original AM radio sounds crisp and clear. Need to drive this Boss up in cold weather? No problem � crank the heat � it operates as new! On the floor is a brand new set of correct reproduction black rubber floor mat son top of that original carpeting. This was a car that very obviously never spent any time sitting out in the sun getting weather beaten! New items in the engine bay include: battery; reproduction bolt kit; cap and rotor; hoses, belts; spark plug wires, and coil. 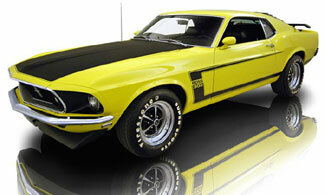 In conclusion, this a perfectly and properly restored original 69 Boss 302 engine, nearly 100% correct in every way. And yes, this is the original engine that came in the car, as verified by all numbers! Mechanically, no expense was spared on the underside of this 69 Boss 302. The following items are correct and new: shocks; leaf springs; fuel lines; brake lines; grommets; body bumpers; upper control arms; lower control arms; inner and outer tie rods; sway bar bushings; u-joints, and factory correct transverse exhaust and mufflers. Could we have re-used some of the tired, 40 year old suspension and brake parts? Sure, but would it have been wise and could you safely drive this car? Probably not. All of the correct and/or original factory hardware was used during reassembly.